Raven was being fed along with some other cats by a neighbor of the shelter in 2012. When the neighbor moved in late 2012 and the weather started turning colder, Cat Guardians set a trap for Raven and caught her. She has spent her entire time with Cat Guardians in a cage situation. She is now starting to venture out of the cage to investigate her surroundings. We’d like to give this shy girl the opportunity to experience life as a cherished house cat. 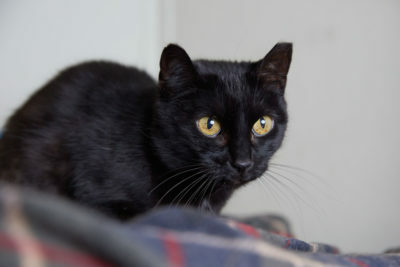 Raven is gentle but very timid, and will need a very patient adopter who will start her out in a room of her own and allow her to gradually expand her territory as she gains confidence. 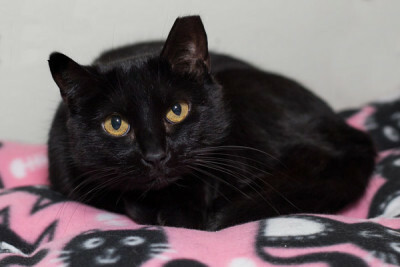 She gets along nicely with other cats and might be a great addition to a multi-cat household. Raven has allergies that are treatable with medication.